As writers, we all want very much to be heard. Nothing gives us more pleasure than when we receive kudos for a job well done. Whether it’s in our ability to make people laugh, or our reminder to look at things through fresh eyes, it’s extremely gratifying to know that our words have made some kind of a difference. Imagine my utter surprise when I received an email back in April (on my birthday, no less!) from a guy we’ll call Joel (mainly ‘cause that was his name) asking me if I’d like to read a very special book. Joel assured me that this was the real deal. He then erased any doubt I might have had by offering to send me several copies of said book that could be given away….as prizes, if you will. Ya gotta love that Joel. For the next three months, we attempted the impossible: Coordinating the shipment and safe delivery of said books…and the arrangement of a phone interview between myself and the author of this book. No easy feat, when I up and move residences right in the middle of things…and then I further complicate things by (rather forcefully) insisting on requesting bookplates, so my copies would be signed copies. Hey...anything for my blogbuds. 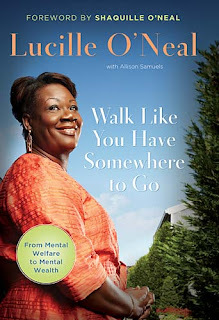 The book is called “Walk Like You Have Somewhere to Go”…and it’s written by Lucille O’Neal. You may have heard of her son, Shaquille. Shaquille O’Neal? The NBA basketball superstar? Yes… that Shaquille. But before becoming Shaquille’s mom for the last 38 years, Lucille was…and is….a person in her own right. A woman with incredible tenacity…who had her own story that needed telling…and was smart enough to realize that as Shaq nears retirement, the spotlight will fade on her now infamous son and their family. And so, now was the time to tell her story. Lucille’s life resonates with adversity…from her parents divorce (in an era when divorce was virtually unheard of), to becoming pregnant at the tender age of 17 (much to the immense chagrin of her stern, domineering grandmother). It takes us through her years of struggle, both as a young teenage mother…and later as she tried to hold together her own family through a tumultuous marriage and its eventual collapse. I liked that. So here’s the deal, people. I’ve got 4 copies of this book that I have permission to give away. (I’m keeping my copy, thankyouverymuch.) I’ll put those interested in a hat and have Connor and Taylor pick the four…that way, it’s a family affair. On second thought, maybe I'll just put your names in the hat. It'll be easier that way. Okay, so maybe you just have to do the first two. Oh, and feel free to comment either way on the LOUD, RAMBUNCTIOUS voice you’ll hear in this snippet of my interview with Ms. O’Neal. I wonder if you’d know it was ME if I hadn’t told you…. Lucille? 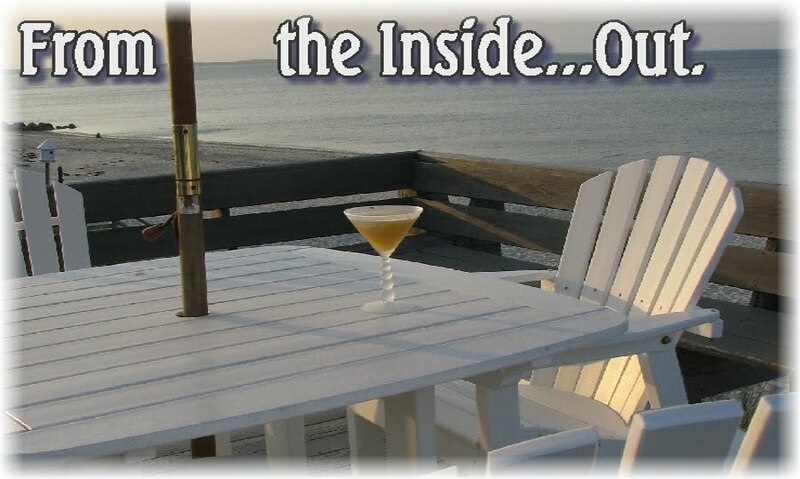 You are now officially part of our elite inner circle of friends, a-la Oprah, Bill, George, Jerry and Ellen. Look at you now... All grown up and rubbing elbows with the mothers of celebrities. I've done it all (as you knew I would! With LOTS and LOTS of enthusiasm!!!!!). Please put me in the hat! This looks like a fabulous read! And you know I love to read. Wow. You sounded just like you do on the telephone! Lol! I'm so glad you finally got to do this interview. She sounds like a remarkable lady with some very sound advice. Go Kathryn! Obviously you're the next Barbara Walters (only way prettier). Ok, done, and with MUCH enthusiasm. Holy COW you talked to his MOTHER. You're FAMOUS. I think I'll write in CAPS at least ONE more time. You continue to astound me....Lucille now knows what a real interview is like. OK. Have you washed your ear where the phone touched it? Mwahaha. Must have been fabulous. As are you, my dear. Wow Kathryn! How cool are you? I was so thrilled to hear your voice and I was on pins & needles waiting to hear what sentence in the book you were referring to and then when you said "verbal serial killer" I thought...why didn't I ever think of that term! Shaq's mom is awesome, as are you! Enter me, enter me, enter me in this here drawing! Coo-ool! You must have had fun speaking with her. I obviously don't know... but she seems like a pretty sharp lady. Go you! Hmmm, thanks, but I'll leave this one to those that have a clue who the heck she or her child are about. I'm not a religious person, but I am fascinated by people who are. People who have this "faith" in something that they can't see, hear or touch, faith in something that doesn't always bring happiness to them or the world in general, and faith in something that allows the terrible tragedies that we see all of the time. I don't have that faith, but I do have faith in myself and my abilities to do my best in the world whatever life throws at me. I guess that works for me. this is super advice but I like to walk with my head in the clouds.. Truly glad to get a snippet at your non-blogging life -- great to have multiple views of you. Throw me into the hat. I completed all your entry requirement. Unlike someone -- my partner in crime, Straight Guy -- who did not wave like Miss American. I did, and I have the tiara scars to prove it. This sounds like a really interesting story though, and one I think all women could benefit from reading! Sounds great! I don't normally enter these-her give-a-way thingys but having had a decent string of good luck in my life lately I thought it might be worth the try. Plus I love to read. And I also realized I haven't commented on your blog in a long while so I was over-due as well :) What a wonderful thing for you to be a part and kudos to you for helping to share such a great story! Okie dokie, I'm following directions now. I am a follower, of your blog... (more of a leader when headed for the bar). I actually have been workin on the railroad so I will excuse myself from the whistling requirement. My audiences are REAL...well in my mind anyway, and does this tiara make my head look big? Ok I followed most of your directions and even though I won't be getting a free book I do feel a little better about myself...except for the giant tiara head. Have a wonderful day!! I just realized you have 666 followers...creepy! I can't listen now because I have a sleeping husband and cat right by me, but I am looking forward to it. Very cool. Also, I like the title of her book. Please put me in your hat! That is just the kind of book I like to read, real life. I would have been leary of a phone call like that, glad it wasn't a scam and your getting to do this. I would love to get this book! This is so cool that you have been able to coordinate this. The interview is terrific as well. Nice job! As you didn't say when the end date for jumping into the drawing would be I hope I'm still eligible. And I didn't know the interviewer was you, how cool is that? Yes, I am a follower and please enter me in the drawing. I promise to share the book with others if I win. Thank you for the very kind comment on my post. Kimberly: YES, you are FIRST in line, bay-bee! Accent? What accent? I'm happily putting your name into the hat! Straight Guy: Yes, you did. And I'm so LOUD, 'cause...I'm a pushy New Yawker? I don't know why I sounded so loud. She's a sweet lady...I wish her only the best. Gigi: You are officially IN DA HAT, sweetie. I'm usually not that obnoxious (yes, I am) or as loud (yes, I am). It was a speaker phone setup...so, she and I kept talking over each other. For some reason, I thought she'd hear me better if I was LOUD. Awesome that you got an interview with Lucille =) And even better that afterwards you still stayed sweet and remembered all of your friends in blog-ville! My large pc is virus bound and gagged so I am using my laptop which has very poor sound. It's a used old Dell. K-J: I do appreciate that enthusiasm! Hey, if your name comes up as one of the fabulous four, then I'm sending it out. It may just take a while to get there! KellyGrrl: Ha! Well then, dance and sing at your own discretion! We don't need any more work rumors...I've put your name promptly in the hat, sweets! Jerry: Aw....I don't know about that. She had a whole truckload of people interviewing her that day. I'm sure we all blended together after a while! Christiejolu: Ms. O'Neal has certainly led an interesting life! If it's true what they say about "what doesn't kill you will make you stronger" then she must be pretty damn strong! "For some reason, I thought she'd hear me better if I was LOUD" has me cracking up over here. Why? Because my New Yawker hubby has the same thought. And no, you weren't loud. Believe me; living in this house, with these boys? I know loud. Lynn: Wow! That IS motivated! I'll admit...it was way cool. What's even cooler was my getting those signed bookplates. I don't know if anyone else thought to ask...I'm just glad that I did! Alicia: You got it, sweetie! Yeah, I loved the way she described her ex as a "verbal serial killer". I'd never heard that expression...but I'll probably never forget it now. Lauren: Yeah...it was great, except for that "speaking over each other" thing you get with the automated recording devices. It took us a little bit to get our mojo...then it was great! Vince: Well, just think of a really famous basketball player from your country...and there you go. Runnergirl: I think we all have differing levels of faith...but maybe it's simply important that you believe in something. Whether it's a higher power, or your own abilities. Faith is faith. I'm new here.... noticed the cocktail on the table and thought I'd stay awhile. Tinkerschnitzel: Honey, you are exempt from the hopping part...I don't need you hurting anything else! I've thrown your name into the hat! Sir Thomas: Well, there's two rules of thought on this: Either you're a creative dreamer...or you've got no sense of direction and are constantly banging into things. Which do you think it is?? sage: Yeah...that Dinah's behavior was always questionable. I do believe my parents informed me that it was "just a song" and had no meaning whatsoever. Jess: Hey, I think everyone feels as you do about having the author's signature inside the book...I think it does make the book more important! I've got you down! Tia: What is it with the injuries lately? You guys need to take more calcium!! Happy to put you in the hat. Hope your foot heals soon! It's been an exciting few months for me and I appreciate the time you took out of your own busy schedule to read and to listen to my story! I am celebrating life each day from now on and I encourage everybody to do the same! What I've learned and still share with others is the fact that our past...does not have to be our future! Let's live everyday and continue to thrive. talk before sleep: Hey you! I'm glad you stopped by! Even though I totally dropped the ball on answering you here, trust that I've entered you into the hat. I'm glad you could stop in...always great to see you, sweetie. Mark Price: You are too funny, mister! Well, I already follow you as well, especially when it's heading towards a bar. As you now know, the railroad-requirement was because I'd thought of YOU, so I knew you were covered there. And I do believe that tiara is very fetching on you. Try wearing it at the bar tomorrow night. Heather: I did! I promise! Thanks for the kind words, sweetie. I thoroughly enjoyed doing it...but I'm glad it's done. It was 4 months in the making! 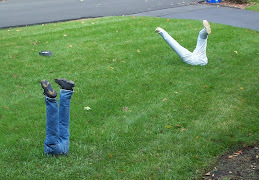 Missed Periods: I can appreciate that...my LOUD NEW YAWK VOICE would have undoubtedly woken hubby. I LOVE the title of her book...that's how I knew I wanted to read it! Jen: You are totally in the hat, sweetie! Thank you for the kudos...she was so kind and patient. I'm sure she must get tired of the same questions...it was a treat to make her laugh! 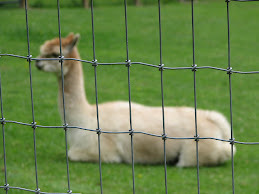 One Woman's Thoughts: You have definitely been included. And I'm happy to reciprocate on all visits...sometimes it just takes me forever to get over there...but inevitably, I will. Promise. Wendy Blum: Aw....aren't you sweet? I'd somehow managed to pare down a 30 minute interview into under 1 1/2 minutes...it only took me ALL DAY to do it. So, I guess this means that I'll do anything you guys too! Gigi: No? Not too loud? God, I winced every time I heard myself. I kept thinking, "Shut up and let the woman tawk!!" Green Monkey: Welcome! I'm so sorry to be so late in saying this. I'm usually better at keeping up. I'm glad you're here and DO hope you stay a while! Jan: You've been entered, sweetie! Thank you for the lovely comment. Ms. O'Neal truly was inspirational...and a pleasure to speak with.